Be more comfortable in your home! Insulation seals crevices and openings, reducing drafts, keeping indoor temperatures more consistent and ultimately keeping your family more comfortable in your home – all year long! As it is installed, insulation expands to fill up even the tiniest cracks and crevices and can make your attic almost 100% airtight! And airtight means less drafty floors and rooms! Quiet down; Insulation reduces outside noise inside. Have you ever walked outside right after a big snowfall? The snow covers everything, even the streets, and muffles the sound. Insulation acts somewhat the same way – like a blanket for your home – keeping the outside sounds outside and your home quieter. Stop paying to heat and cool the outdoors! 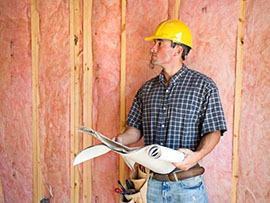 Installing insulation can save you thousands of dollars over time. 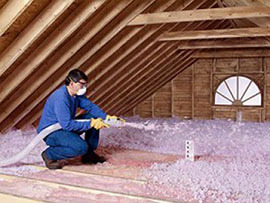 Replacing or adding insulation will help you stop wasting your hard-earned money on air conditioning and heating costs while the air virtually seeps through your ceiling and outside. 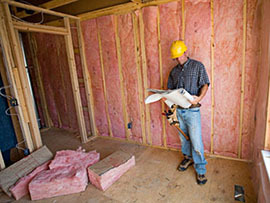 Our insulation is environmentally friendly and contains recycled content. So by insulating your home, you not only save energy, you’re using green materials to do so! Mold in the attic – yuck! Moisture is extremely bad for attics and walls. Over time, moisture can cause cracks in concrete, breed dangerous mold, and create a horrible smell. 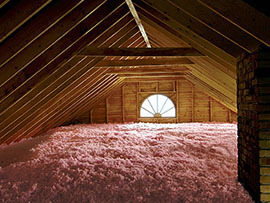 Insulation can help regulate attic temperatures, reducing the environment that mold and mildew love so much.